Top Notch Material: (2) Win Rudolf the Red-Nosed Reindeer from Silver Dolphin! (2) Win Rudolf the Red-Nosed Reindeer from Silver Dolphin! We love everything Christmasy here, and we especially love Christmas books and movies. I love snuggling up with my boys and reading Christmas books as we approach the most wonderful time of year. 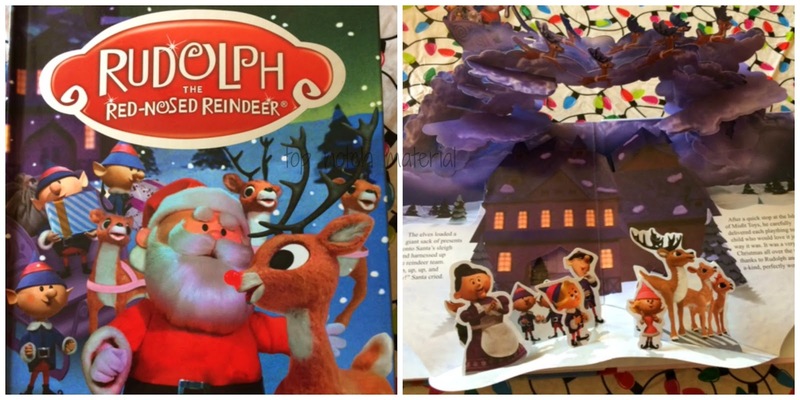 So when I was asked to review the new Pop Up book, Rudolf the Red-nosed Reindeer, which puts a delightful spin on traditional Christmas books, I jumped at the chance! Start a new holiday family reading tradition with a delightful pop-up retelling of this beloved Christmas special. Just in time for its 50th anniversary, Rudolph the Red-Nosed Reindeer® is now a stunning pop-up book that is sure to wow Rudolph fans of all ages. All of the classic characters join Rudolph for his North Pole adventure: Hermey the elf/aspiring dentist, Yukon Cornelius, and the doe-eyed Clarice. The impressive large-scale pop-ups re-create classic scenes using actual movie stills. Fly along with Rudolph, join in the reindeer games, flee from the Abominable Snow Monster, visit the Island of Misfit Toys, and save Christmas one foggy night. Gather the kiddos, grab a snuggly blanket and be touched by the timeless story of acceptance and discover the true meaning of the holiday spirit. Both of my boys absolutely loved reading the book with me and my younger son just loves the pop ups. The pop ups in the book are more breathtaking than traditional pop up books and really make you feel like you are participating in the story. This book has interested my boys enough that they have asked to watch the movie with me, so I cannot wait until it comes on television and we can watch it together with a cup of hot chocolate. This is, after all, what the Christmas season is all about, right? Win It! (2) Winners will receive a copy of Rudolf the Red-Nosed Reindeer from Silver Dolphin! We would love to have the Color and Play: Dinosaurs book, as well! My niece would enjoy the Sounds of the Wild: Animals book. I would also love to buy the Smithsonian Young Explorers Ocean book for my daughter, she'd love it! I would like the The A to Z Book of Wild Animals. I would like Crunchy Croc. I would love to have a copy of the Smithonian's Oceans book for my grandson. I entered the Choice of Wallet. I would love to have Smithsonian Young Explorers: Oceans for my son.